Work began with a fracture trace analysis, and review of existing geologic literature to determine the locations on the golf course with the greatest probability of drilling a high yielding well. During drilling of the second well, a large water-bearing zone was encountered, producing hundreds of gallons per minute. As the golf course is located within the DRBC Groundwater Protection Area, any water withdrawals over 10,000 gallons per day require a Water Withdrawal Permit. 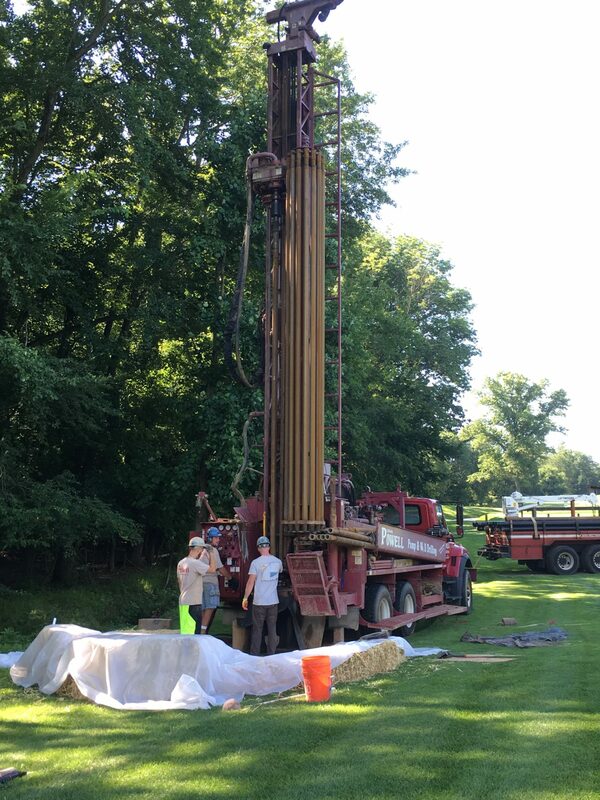 Brickhouse Environmental completed hydrologic testing and analysis required to obtain the DRBC Permit, including the installation and monitoring of three observation wells, monitoring of an adjacent stream, monitoring of adjacent residential wells, and a rock outcrop analysis. A 72-hour, constant-rate aquifer pump test was conducted and, upon review of the data, Brickhouse determined that the underlying bedrock structure had a large influence on water withdrawal impacts to the adjacent stream or groundwater users. Based on this analysis, Brickhouse was able to develop a water withdrawal rate and operating plan that protected water resources, resulting in the issuance of the Water Withdrawal Permit. In parallel with receipt of the DRBC Water Withdrawal Permit, Brickhouse Environmental provided engineering services for the design of a large storage lagoon. The design maintained the functionality of the storage lagoon, while ensuring compliance with municipal ordinances combined with the aesthetics desired by the golf course. Permitting for the lagoon is scheduled for Fall 2018.